Louisiana’s most famous female artist, Clementine Hunter, didn’t start creating art until around the age of 50. Born just a few decades after the Civil War, Hunter lived most of her life on the Hidden Hill and Melrose cotton plantations where she worked as a field laborer and domestic worker, respectively. 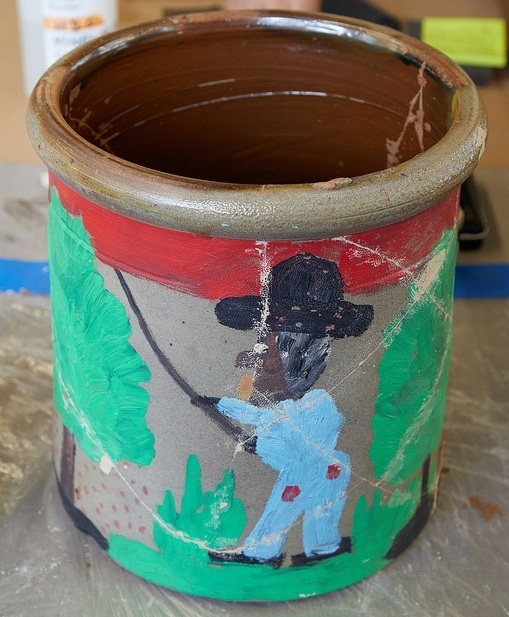 It wasn’t until the mid-1940s when a visitor of the plantation left behind art supplies that Hunter began to create the art she is known for today. Clementine Hunter; image courtesy of 64 Parishes. Detail exhibiting Hunter’s unique style. 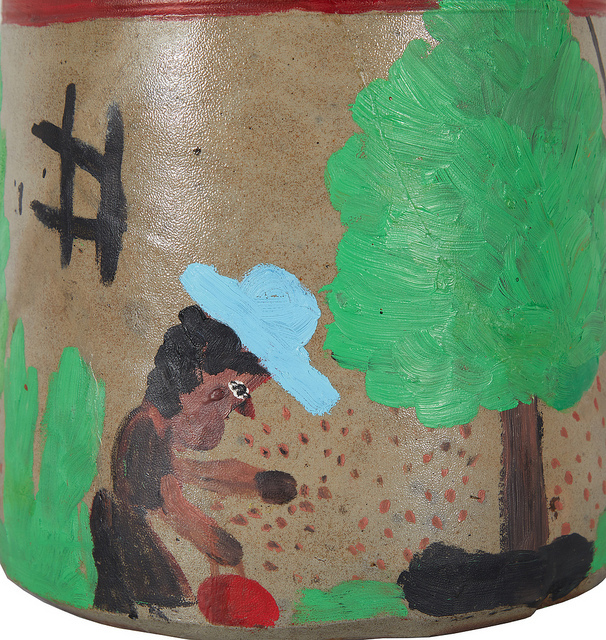 In the early stages of her artistic career, Hunter’s paintings would sell locally between 25 cents and a dollar each. Later, she would become “the first African-American artist to have a solo exhibition at what is now the New Orleans Museum of Art. But because of Jim Crow laws of the era she couldn’t attend” (Smithsonian.com). Hunter gained success as an artist and exhibited her works in New York City and Los Angeles during her lifetime, though she never wanted to travel outside of Louisiana to see them. Today, Hunter is widely known, and even has the largest collection by a single artist at the Smithsonian’s National Museum of African American History and Culture. 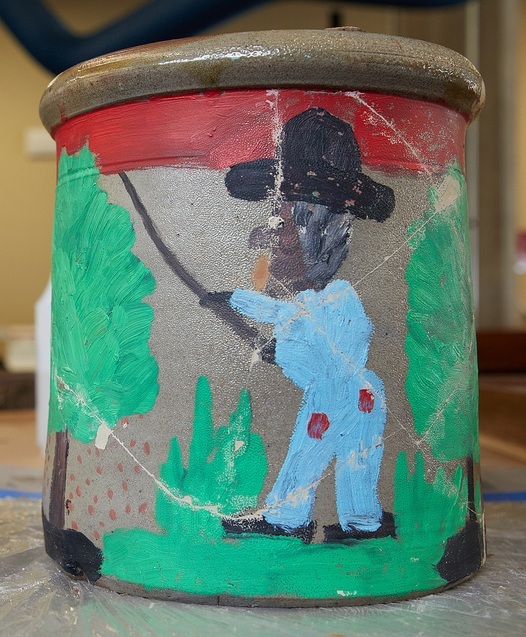 Our client, who purchased “Pecan Pickin’” at an estate auction in Louisiana, told us that the piece had shattered during shipment to his home. He brought the piece to The Center in many large fragments, all of which were retained. However, small scattered areas of loss were identified in and around the fragments. After the treatment proposal was approved and initial photography was completed, our Objects Department began their work. During-treatment detail of the interior of the piece. The broken pieces were fit together like a puzzle and were secured using a conservation-grade adhesive. Since there were some minor losses around the fractures, our conservators added a fill composed of conservation materials. These fills were contoured and colored to emulate the surrounding areas. 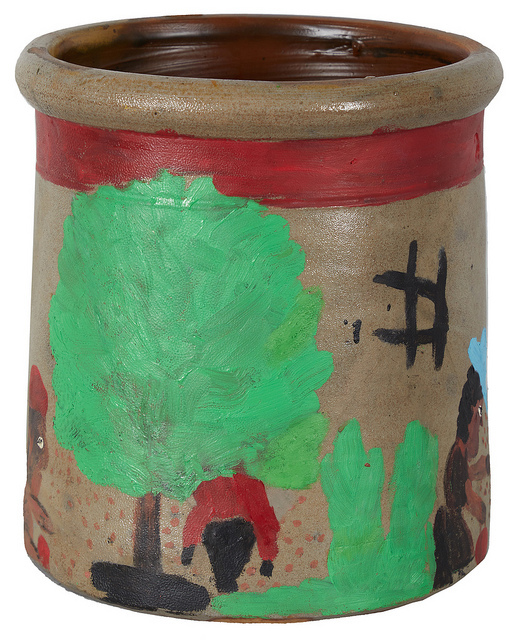 Finally, this unique piece of plantation pottery was restored.